Enjoy the popular traditional look in your bathroom with this beautiful vanity. Made with a special white solid wood base and a white marble counter, this piece will make your bathroom look even nicer. This set from Wyndham Collection is great for anyone looking for great style and function in their bathroom. Acclaim 72-inch W 6-Drawer 4-Door Vanity in White With Marble Top in White, 2 Basins With Mirror Enjoy the popular traditional look in your bathroom with this beautiful vanity. Made with a special white solid wood base and a white marble counter, this piece will make your bathroom look even nicer. This set from Wyndham Collection is great for anyone looking for great style and function in their bathroom. 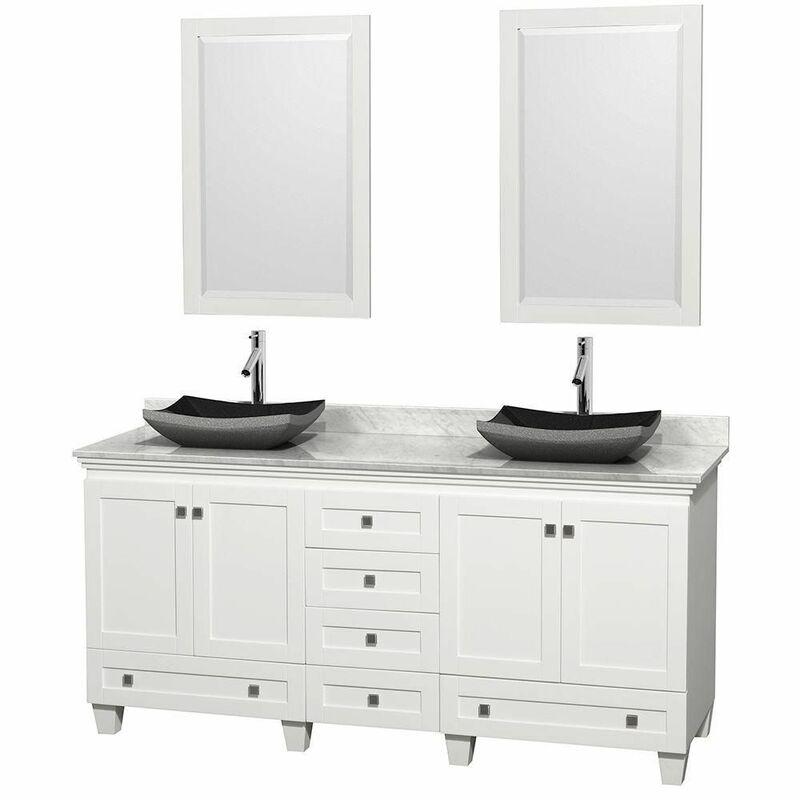 Acclaim 72-inch W 6-Drawer 4-Door Vanity in White With Marble Top in White, 2 Basins With Mirror is rated 4.8 out of 5 by 5. Rated 5 out of 5 by Traci from This is a beautiful cabinet and looks great in our... This is a beautiful cabinet and looks great in our bathroom. Rated 5 out of 5 by Divegirl2 from I just had the vanity installed and I am very pleased. It was better looking in person than the o... I just had the vanity installed and I am very pleased. It was better looking in person than the on line picture represented. Seems very sturdy and the marble top is heavy and thick. I loved the shape of the vessel sinks. The faucets were also purchased at home depot that I have in the photo of the vanity. It really gave the room a spa like make over, which was exactly what I was going for. Rated 5 out of 5 by Divegirl2 from Spa bathroom This exceeded my expectations and had a nice clean look. I was going for a spa look and this fit the bill. Rated 5 out of 5 by lizziecat from beautiful....exactly what I was looking for Buying online is always a challenge, but I was so happy when the vanity arrived with the marble top very well protected in wooden crate and sinks in separate boxes. Looks wonderful in my new Master Bath.